The Anderson Community celebrates its Grand Reopening on Friday, January 26, 2018 with a ribbon cutting. harp music, food and beverages. The community is invited. Please let them know you are coming. Email or call 206-364-9336. Anderson Community has renovated buildings and is opening a memory care unit. 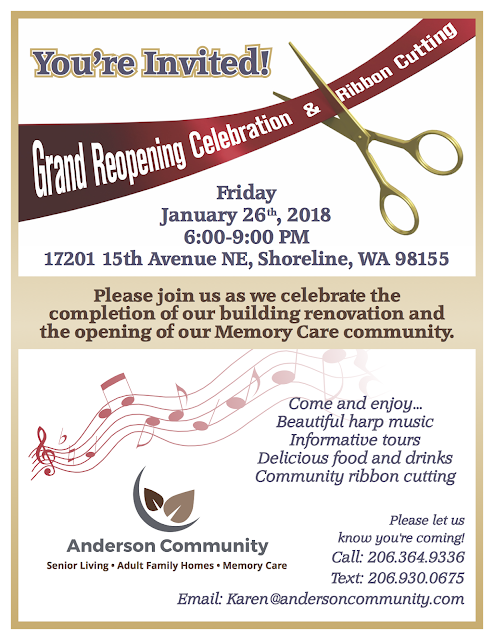 Anderson Community is located in North City 17201 15th Ave NE, Shoreline 98155.